A stain on your deck is nothing new, but finding a way to get rid of it without purchasing a specific deck cleaner might be. Your deck puts up with a lot of abuse, from barbecues and dinners to gatherings of friends and play dates. Perhaps you recently took a closer look after cleaning the deck and realized that you have a few stains that need some extra attention. Get rid of those using a combination of items you already have around the house and a little elbow grease. Your deck is bound and determined to have some leaves or moss on it at one time or another, especially if you live somewhere with a lot of trees. When these plants touch wood for long amounts of time, they can leave stains on the deck, even after you’ve scraped or swept the leaves and moss away. To get rid of these stains, use a combination of bleach and water. Leaf stains can be scrubbed away with a solution of 1 part bleach to 1 part water. For moss, which can grow on the wood, try a solution of 4 parts bleach to 1 part water, and repeat when necessary. Those greasy spills from barbeques will stick to your deck like glue, rather than evaporating like water and lighter liquids. To remove these oily stains, a mixture of Dawn dish soap and water can work wonders on any grease spill. For more stubborn stains, powdered dish washing detergent and water will scrub away stains with its more abrasive texture. When scrubbing, however, be sure to test this mixture on a small area first, in order to be sure it doesn’t harm the finish on your deck. Wine stains are some of the most difficult to remove, especially if they have absorbed into a wooden deck surface. First, try a bleach and water solution such as the one suggested above for plant stains, with a scrubbing brush or an old toothbrush. If that doesn’t work, try oil soap combined with hot water to remove the stain. If the wine stain is being stubborn and won’t come out using one of those methods, combine baking soda and water to make a paste to scrub it out. The first thing to do with tree sap is scrape it away with a putty knife or butter knife, so that all that is left is the stain against the flat surface. An oil soap can be very effective in removing tree sap from decks, but works best on sealed ones. Pour the oil soap onto the sap stain and let it sit for at least 15 minutes before scrubbing or rinsing it away. If oil soap doesn’t remove it all, try dabbing at the tree sap with nail polish remover or WD-40. As with most solutions, try a small spot test first if you’re afraid the cleaning solution might harm the surface of the deck. 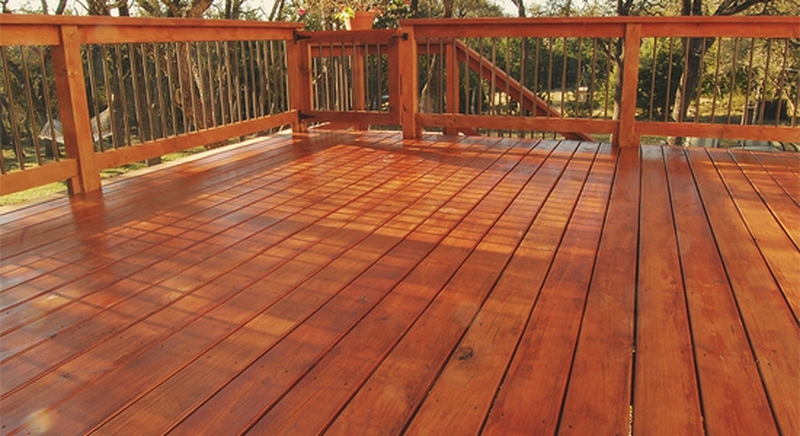 Stains left from pets on the deck can be removed using a vinegar and water mix. Combine 2 gallons of water with ½ a gallon of white vinegar, and then pour it onto the stain. Scrub the spot with a brush and let the solution soak for about 30 minutes, then rinse it with the hose. The vinegar should clean the spot and get rid of the smell. You can repeat this cleaning method several times until the stain is completely gone. If you have a stubborn stain that won’t go away, you can also try a baking soda paste on the spot after rinsing the vinegar away. The combination of these two solutions should do the trick.